This illustrated graphic shows the two newfound Kepler-20 planets shown to scale with Earth and Venus. The year 2011 saw the discovery of a bountiful crop of alien planets. Scientists discovered the darkest world, a diamond world, a new class of rogue worlds and more. NASA's Kepler space observatory has even found two Earth-size worlds around a star 950 light-years away — the first-ever exoplanets confirmed to be the size of our home planet. Take a look at the most intriguing alien planet finds of 2011 and cast your vote for your favorite! In May, astronomers announced a huge new class of extrasolar planets - the rogue alien planet. A vast population of Jupiter-mass worlds floats through space without any discernible host star, the study found. 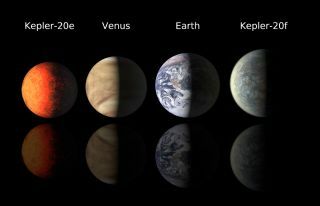 While some of these exoplanets could potentially be orbiting a star from very far away, the majority of them most likely have no parent star at all, scientists say. On Dec. 1, astronomers announced they found the ultra-hot alien planet Kepler-21b, a world with a surface temperature estimated to be about 2,960 degrees Fahrenheit (1,627 degrees Celsius) — hot enough to melt iron. Kepler-21b is located 352 light-years from Earth and is 1.6 times bigger than our own planet. It sits just 3.7 million miles (6 million kilometers) from its host star and takes 2.8 days to complete one orbit. Earth, for comparison, zips around the sun at a distance of 93 million miles (150 million km). The discovery of the darkest alien planet yet found was announced in August, when astronomers unveiled the existence of dark planet TrES-2b, a world about 750 light-years away in the direction of the constellation Draco. Another planet discovery announced in August carried a sparkly twist: the dense planet was likely made of diamond. Known as planet PSR J1719-1438, the extrasolar world orbits a dense neutron star about 4,000 light-years from Earth in the constellation of Serpens (The Snake). The super-high pressure of the planet has likely caused the carbon within it to crystallize into an actual diamond, researchers said. In October, astronomers announced an astounding feat: They had spotted the actual birth of a planet. Researchers used Hawaii's Keck Observatory to capture the first direct images of the still-forming planet LkCa 15 b, which is in the process of coalescing around a star 450 light-years away in the constellation Taurus (the Bull). As far as infants go, LkCa15 b looks like a whopper, perhaps harboring as much mass as six Jupiters. But since the planet is still forming, it could end up being considerably smaller, scientists said. However big it is, the alien world is definitely young. Its parent star, which is about as massive as the sun, is only about 2 million years old. The year 2011 began as it ended, with the announcement of what was at the time the smallest alien planet yet seen. It is located about 560 light-years away. In the January announcement, astronomers confirmed that the small alien planet Kepler-10b was not only just 1.4 times larger than Earth, it was also a rocky world - a major find. Kepler-10b reigned as the smallest known alien planet until December, when the discovery of two new planets - one the size of Earth and the other slightly smaller - was announced. The large alien planet HD 85512 b wasn't alone when its discovery was announced in September. The planet was one of 50 exoplanets found by a European telescope, but it was the only one in the group that could potentially be a haven for life. HD 85512 b captured astronomers' attention because it orbits at the edge of its star's habitable zone. The potentially habitable super-Earth is estimated to be only 3.6 times more massive than Earth, and its parent star is located about 35 light-years away, making it relatively nearby. It's a real-life Tatooine. A spectacle made popular by the "Star Wars" saga — a planet with two suns — has now been confirmed in space for the first time, astronomers revealed on Sept. 15. The Tatooine-planet Kepler-16b has two suns, which it orbits in a system located 200 light-years from Earth. "This discovery is stunning," study co-author Alan Boss of the Carnegie Institute in Washington said at the time. "Once again, what used to be science fiction has turned into reality." In early December, NASA announced the discovery of planet Kepler-22b, the first confirmed alien planet inside the habitable zone of its parent star found by the agency's Kepler space telescope. The planet is about 600 light-years away, orbiting a sun-like star. Kepler-22b's radius is 2.4 times that of Earth, and the two planets have roughly similar temperatures. If the greenhouse effect operates there similarly to how it does on Earth, the average surface temperature on Kepler-22b would be 72 degrees Fahrenheit (22 degrees Celsius). In mid-December, NASA broke more exoplanet news with the discovery of the first Earth-size alien planets ever confirmed beyond our own solar system. The two planets, called Kepler-20e and Kepler-20f, are roughly the size of Earth, but it is Kepler-20f that that is the closest to Earth's size twin of the pair, scientists said. They orbit a star 950 light-years from Earth. Kepler-20f is 1.03 times the size of Earth and makes a full orbit every 19.6 days at a distance of 10.3 million miles (16.6 million km).